Today we host the wedding reception of Vicki & Tim - so we are preparing the property and setting up tables and chairs for their special party. They were married about two weeks ago at a small, private ceremony on a beach next to the waves of the Atlantic Ocean. Today about 100 of their family and friends will gather to share the joy of their love. It's been fun planning this event with the bride! We've been searching out decorations to match the "beachy" theme. The tables will be using ocean blue table cloths and then decorated with fishing nets and sea shells. 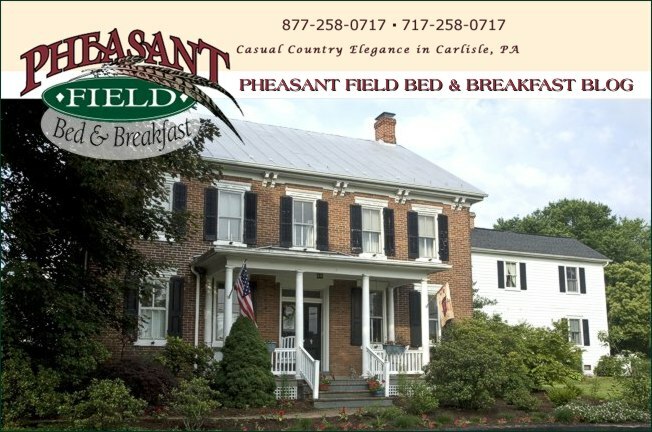 We plan to have a very fun day here at Pheasant Field Bed & Breakfast! If you're planning a wedding or reception in the future, take a look at some of ourpictures and send us an email to get all the scoop on special events here at our Carlisle B&B.